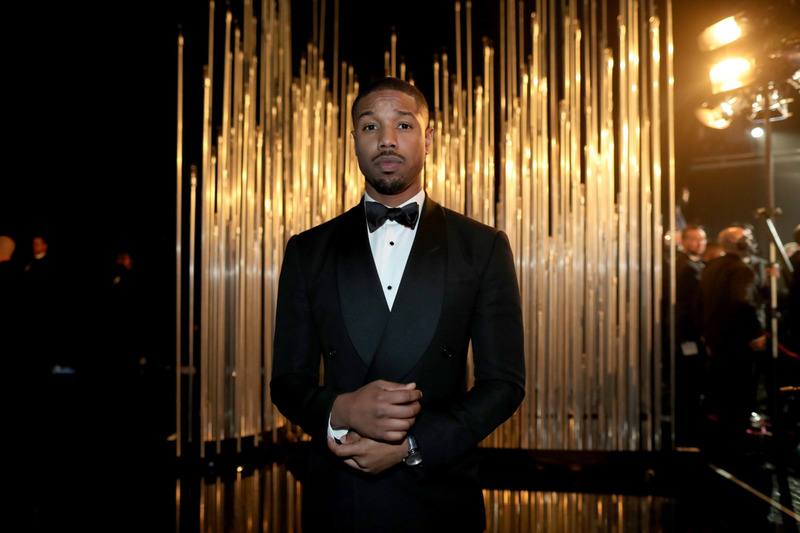 'Creed' Actor Michael B. Jordan has been on the Hollywood scene for a while now and every time we see him he's dressed to impress. Whether he is on a press run for his latest movie, on the red carpet for an award show, at a daytime event, or casually out and about there is a confident cool to his style. We give a few wardrobe tips based on what we've seen from Michael B. Jordan and how you should implement it into your fits for the summer. The key to dressing for the summer is to keep it light. Michael B. Jordan is here at the Polo Classic with white dress shirt that has small blue polka dots, a navy blue hemmed dress pants, and tan shoes. Wear a lightly colored t-shirt or dress shirt when going out to a daytime event because anything with a dark tone will attract the heat and you don't want to be a sweaty mess when you take a photo with a bunch of beautiful ladies. In this Vogue photo shoot with model Liya Kebede Michael B. Jordan is rocking a purple tinged Dolce & Gabana adorned with assortment of flowers. Have that one suit or one fit that stops people in the streets or has everyone talking at a party. Surprise yourself with going outside your comfort zone and have fun with your wardrobe. Warning! This look is only for the ones confident to rock it. 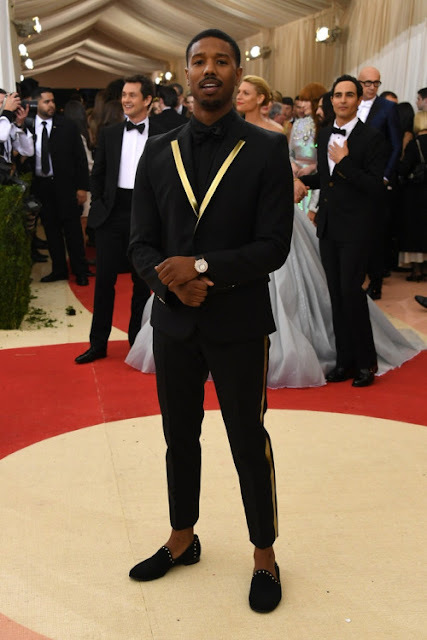 Michael B. Jordan wore this look at the 2016 Met Gala. The reason why he pulled this off and you can to is to now when and where to have this look. Wearing a black suit with gold streaks on the lapel and alongside his hemmed fitted pants slightly above the ankles the perfect touch was no socks with his black loafers. The Met Gala is notoriously known for taking chances with your style. You want to stand out? You want to be known as the most memorable fashion statement of the evening? Than you'll boldly adopt this look. Wearing a suit to a black tie affair is always a good look but what's even better is a suit that fits. Even casual day wear or daytime events wearing cloths that fit highlights the gains you've made at the gym and aesthetically it looks better. Invest in suits that actually fit you and the ones you already have take them to a tailor. Michael B. Jordan at the 2016 Oscars wore a double breasted Dolce & Gabana suit looks to be tailor made for him because it probably was. Michael B. Jordan is your style idol for the summer because he takes chances with his attire, knows when to stunt on people to make a bold statement, and his suits fit to his cut - so watch and learn.